Two Reagan conservatives who believe that the left has it wrong and just doesn't get it! JUST SAY THANKS - send a greeting to out troops by clicking on this link and you can, Just Say Thanks ! Article I of The United States Constitution established the Legislative Branch, The Congress. Article II established The Executive Branch, The Presidency. Article III established the Judicial Branch, The Supreme Court and Federal Court system. Three separate Branches of government with separate powers to specifically create a check and balance system of government to prevent any one man or group of men the ability to become a dictator, tyrant or establish any Monarchy. Barack Obama does not believe nor accept this Constitutional principle which established by law the separation of powers and checks and balances of our government because Obama is more interested in total control through the Presidency and using his executive power to bypass Congress and create government give-aways to bribe duped voters into reelecting him in 2012. In a blatant disregard for The Constitution so much so that he arrogantly announces his disregard and his plan to violate the separation of powers of The Constitution as he announced several times during his ridiculous tax payer funded campaign tour to push his jobs bill, finishing up with a new ,"plan," to change the way Student Loans are handled, Obama stated on the record that he had instructed , "his administration," to find any and all ways to begin the provisions in his jobs bill and change the Student Loan program, "without Congress." The reason our Founders established three Branches with separate powers was to prevent exactly what Obama is trying to do. One man forcing policy, spending the peoples money and dictating what government does without the people or the Representatives of the people involved. In other words a tyrannical dictator who cares nothing about Constitutional principles and arrogantly believes that ONLY he knows what to do and how to do it. What makes matters worse are the crowds who were selected to attend the Obama circus and listen to these arrogant, divisive and dictatorial speeches actually cheered when he told of his instruction to his administration to do whatever they had to do to implement his jobs bill and student loan changes without Congress. A President has NO CONSTITUTIONAL AUTHORITY to appropriate money, or change any program that involves funding such as the student loan program. The Constitution is very specific in this, ALL bills of any financial origin must begin in The House and then pass through the Senate BEFORE they reach the President who can then sign or VETO and if VETOED then RETURN to Congress for revision or to die a legislative death. Yet Obama ignores this Constitutional law and instructs his administration to find any and all ways to implement the jobs bill which will cost half a trillion dollars and change the student loan program which uses tax payer money without Congress, the peoples Representatives and therefore ignoring the people of The United States and acting as a dictator. We are not a third world dictatorship. We are not an Autocratic society where one man has the power to implement anything much less program that spend the peoples money and waste it for his personal political gain to shore up his base for a reelection bid which is perilous at best. I have always had a certain amount of respect for any man who has held the awesome office of President of the United States. Although I completely disagreed with Jimmy Carter and Bill Clinton there was still a certain amount of respect because of the office they held. 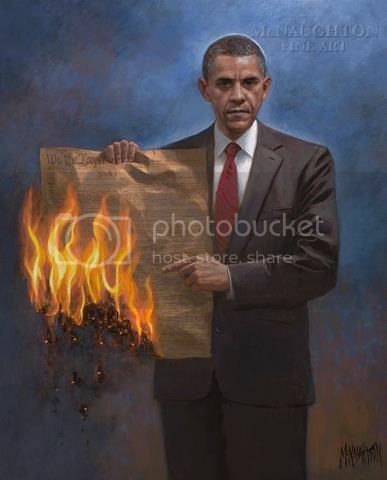 I have absolutely NO respect for Barack Obama and am disgusted with him, the direction he is taking our country and especially the lie he told on January 20, 2009 when he stated with his hand on the Bible of Abraham Lincoln that he would, "preserve, protect and defend The Constitution of The United States." Anyone who still supports Barack Obama a liar who seeks to destroy America, act as a dictator and ignore our Constitution and the people, no longer believes in our country and all that we as a Nation stand for. Obama and those who still support him and what he does insult the thousands who have died defending the very Constitution and principles of freedom and liberty that are America and spit on the graves of the brilliant men who founded the United States of America. I agree with you. As an example, I thought Obama's dismissive comments toward the supreme court justices during his state of the union address was one of the most sanctimonious things I have seen a President do. And Obama's recent comments about small business owners drive me up a wall too. "If you built a business you didn't really build it," actually you kinda did. We need more start up small businesses in this country. Where do you think most of the few jobs that have been generated during your administration have come from Mr. President? Provided by website hit counters website.